Lawrence Alma-Tadema, Dutch and English artist, master of historical and mythological painting, passionate archaeologist. Alma-Tadema was born on January 8, 1836 in the town of Dronriypt, the land of Friesland in the Netherlands. The art of painting was studied by Dutch masters Josef Laurentis Dikmans, Byron Jan Hendrik Leys, Byron Gustav Wappers. The artist’s early works contain a subtle but insurmountable similarity to the art of Dutch masters. However, in the 60s of the XIX century, the artist Alma-Tadema made a trip to Italy and this trip turned his whole life. During the expedition, Alma-Tadema collided with the ruins of ancient Roman cities – Pompeii and Herculaneum. Fascinated by the beauty of ancient Roman civilization, and especially the details of everyday life, he began a fruitful study of ancient Rome. Roman archeology, painting and culture became for Alma-Tadema a passionate passion that lasted a lifetime. 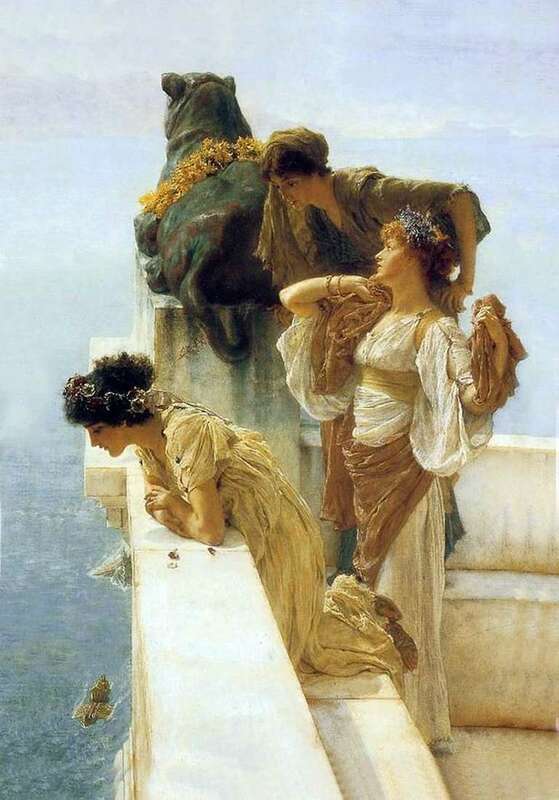 Interest in ancient Rome is seen in many works of Alma-Tadema. The truth and convincingness of his paintings Alma-Tadema is primarily due to his thorough knowledge of archeology. The artist knew perfectly well how the ancient Romans were dressed, what was the armament of the troops, what kind of houses were ordinary citizens, villas of patricians, workshops of artisans, markets and baths. The artist Alma-Tadema studied the ruins of churches, met in detail with the duties of the priests, with the course of ancient ritual ceremonies, the order of sacrifices and festive processions. When Alma-Tadema moved to England in the seventies of the XIX century, his painting style was already formed and connoisseurs enthusiastically welcomed the new works of the talented artist. In the exotic house of the painter in London, you could personally see all those famous swimming pools with marble benches and columns, antique utensils and apparels known from his paintings. Representing baths, amphitheaters, atriums of houses, he wrote from nature what really was in his own “ancient Roman” house. The tranquil beauty of such paintings as “Profitable position” and “Silver trinkets” create a unique atmosphere of the audience’s unseen presence. Beginning with the early, so-called “Pompeian period” and ending with late, more sentimental works, the artist Lawrence Alma-Tadema left us a legacy of beautiful, remaining in the memory of the picture. Lawrence Alma-Tadema died June 28, 1912 in Wiesbaden, Germany. Description and meaning of the painting Favorable position by Lawrence Alma-tadema.